An epidural steroid injection is a type of injection in which cortisone is delivered to the outermost section of the spinal column, called the epidural space. It is used to treat radiating nerve pain from the low back, middle back, or neck. Cortisone is a type of steroid naturally produced by the adrenal gland which is released during times of stress. The steroid suppresses the immune system and, by doing so, reduces inflammation and the associated pain. While natural cortisone is relatively short-acting, the type used for an epidural injection is artificial and can last from anywhere from a week to months. As opposed to a systemic cortisone shot delivered into the bloodstream, an epidural injection is delivered at or near the sources of the nerve pain, providing targeted relief. It is typically used to treat pain associated with nerve root compression in the spine, such as that caused by a herniated disc, bone spur, compression fracture, annular tear, degenerative disc disease, or spinal stenosis. A "pinched nerve" is the term commonly used to describe the condition. While an epidural steroid injection is often used in isolation, it is most effective when combined with a comprehensive rehabilitation program to reduce the need for future injections. Epidural injections are only meant to provide short-term relief, often to delay spinal surgery, or to aid in recovery following spinal surgery. Traditionally, the shots were administered without any special equipment. Today, a real-time X-ray technique, called fluoroscopy, can be used to identify the exact location of the compressed nerve root and ensure the needle is correctly placed in the epidural space. A computed tomography (CT) scan, which also uses ionizing X-ray radiation, can also be used for this purpose. Cervical injections are delivered into the neck region. Thoracic injections are delivered into the middle spine. Lumbar injections are delivered into the low spine. Epidural injections can also be described by the path of the needle. Injections placed between the shingle-like bones of the spine, called the lamina, are referred to as interlaminar epidural injections. Transforaminal injections are those that enter the spine at a diagonal direction along the path of the nerve root. 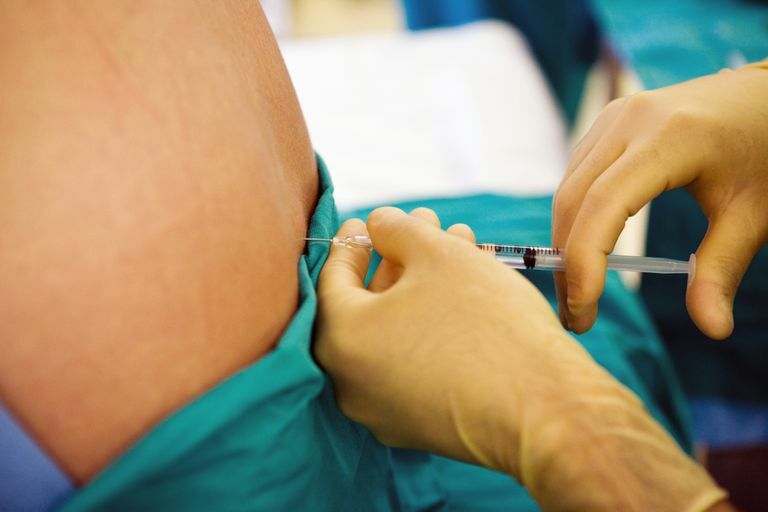 Epidural steroid injections can be delivered by anesthesiologists, orthopedic surgeons, neurologists, interventional radiologists, pain management specialists, and others medical professionals trained in the technique. Epidural steroid injections are relatively safe with a low risk of complications. One of the most common risks is the accidental puncture of the tissue surrounding the spinal cord called the dura mater. If this happens, fluid can leak out and cause a spinal headache. As per its name, headache is the central symptom. The injury is typically treated with bed rest and/or a procedure known as a blood patch in which blood is injected over the hole to form a seal as it coagulates. If the needle touches the spinal cord or nerve root, it can cause short-term neurologic injury manifesting with numbness or tingling in the extremities for hours or days. With the advent of X-ray-guided injections, the incidence of this has dropped dramatically. Allergic reactions are rare (in the region of 0.3 to 0.5 percent) but may require emergency intervention if you experience wheezing, shortness of breath, hives, facial swelling, rapid breathing, and an irregular heart rate. Infection is also uncommon. An epidural injection takes a bit more preparation and recovery time than a traditional injection given the delicacy of the procedure and the need for a local anesthetic. Generally speaking, you would be allowed to have a small meal several hours before the procedure and can continue taking your normal medications. The only exceptions would be anticoagulants (blood thinners) or anti-inflammatory drugs (like aspirin or ibuprofen) that can cause bleeding. Your doctor will tell you when to stop these drugs. Once you've arrived for your appointment, you will be asked to remove some or all of your clothing depending on where the shot is to be delivered. A hospital gown will be provided to change into. After changing, you would be led to the imaging room where an intravenous (IV) line would be placed in one of your veins. Medication may be delivered to help you relax. You would then be placed on the X-ray machine over a bolster to help open the spaces between the spine bones. In other cases, you would be placed in a seated position with your neck or back tilted forward. The skin will be cleaned with an antibacterial swab and injected with a local anesthetic to numb the area. Once fully numb, the doctor will insert the needle through the skin toward the spine. A small amount of dye may be injected to verify the needle's position on X-ray. Finally, the cortisone will be delivered into the epidural space mixed with a mild anesthetic. Once completed, the needle and IV line would be removed and the puncture wounds bandaged. You would need to remain in the recovery room for around an hour. If your vital signs check out, a friend can drive you home. You would not be allowed to drive yourself. It is not uncommon to feel drowsy after the procedure or to experience a mild tingling or numbness in the legs. These symptoms should wear off by the end of the day. Call your doctor if they persist or worsen. On the other hand, seek emergency care if you experience any signs of infection or allergy, including high fever, chills, hives, breathing problems, nausea, vomiting, or severe pain. Epidural steroid injections are effective for providing short-term relief of severe acute or chronic radicular pain. They are used under very specific conditions and typically avoided if the pain can be treated with physical therapy or less invasive forms of therapy. If you believe that you qualify for an epidural injection, meet with an orthopedic specialist who can advise you whether it is an appropriate option or if there are alternatives that may be just as effective or longer-lasting. What Is a Carpal Boss? How Do I Treat a Herniated Disc? How Does Your Physical Therapist Measure Range of Motion? Are Ultrasound-Guided Injections Worth the Expense? How Long Does It Take a Cortisone Shot to Work?